Clifford has not been heard from for a few days, so the team is taking advantage of his silence by searching for alternatives to defeat him. Caitlin, while concerned about Clifford’s attack, is more focused on Killer Frost’s absence from her life. I’m all for Caitlin being selfish and thinking of herself in this time of need; she always takes care of the team before herself. However, looking to Amunet Black as the solution is a desperate move. She suggests turning to Amunet for help, as her powers are organic and could help defeat Clifford’s technophile abilities. She isn’t forthcoming with the information that she believes Amunet can help bring Killer Frost back, but while searching for her, Joe begins to put the pieces together. He doesn’t seem to mind her motives but asks her to inform the team so they’re not in the dark. Team Flash hates secrets, after all. After tracking Amunet down, they return to STAR Labs with her in tow, hopeful they can use her against Clifford. It doesn’t take long for Caitlin to come clean with the team on her true intentions, and while initially concerned, no one protests. At this point, they can’t be picky who helps them. But to receive Amunet’s help, they need to do something for her first. No one should be surprised that Amunet requires a type of payment, but there is still that lingering fear she will betray them. Norvok took her shards, and she wants them back. Amunet can’t face him alone, so the team is dragged into the fight with her. After the last altercation with Amunet, I feel as though she has lost her edge. She’s not as bloodthirsty as she once was, and appears to care for Caitlin. Amunet even reaches out and sits with Caitlin, discussing the problems she’s facing without Killer Frost. Of course, knowing Amunet, this personality change might be to ensure she’ll get what she wants, but the sit down with Caitlin did wonders. The showdown with Norvok, who possesses Amunet’s shards, ends as quickly as it begins. 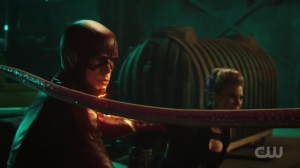 Even though it’s quick, Barry manages to be poisoned and has difficulty phasing through the poison while Amunet takes on Norvok on her own. Lucky for Barry, he has Iris by his side to talk him through it, and he lives to see another day. Amunet easily defeats Norvok by retrieving her shards and is prepared to move on before Caitlin calls her out. She seems guilty, which is a new look for Amunet and gives the team an organic grenade to use on Clifford. I didn’t expect she would fight by their side, so this weapon is better than nothing. While Amunet Black occupied most of the team’s time, Harry and Cisco tried to work on Harry’s diminishing brain function. Cisco calls upon the Council of Wells for advice, but they refuse. So Cisco reaches out to different Wells who are more empathetic than their brainy counterparts. What initially seems like a gimmick to fill space, ends up being a valuable learning experience for Harry. He starts thinking of others; maybe it’s been there all along, as his interactions with Cecil and Jessie have proven Harry opening up. It hits him quickly after–; Harry realizes Clifford is the same as himself, and his absence signifies someone important is missing:; his wife. It’d explain Clifford’s lack of activity, and maybe help the team in the long run.